It’s Committee week again and it looks like it’ll be a busy one with lots on the agenda. Over 35 inquiries were made, but only 3 residential sites were setup. Timing and strict neighbour permission requirements are blamed for the low numbers. All 3 sites successfully complied with the provisions of the pilot. Participants, neighbours, and community members were all surveyed – just one respondent indicated they did not support the idea of urban beekeeping. Hives can only be in the backyard, and must be at least 3 meters from a neighbouring fence line. You can only have one active hive in your yard, consisting of a bottom board and hive cover with no more than four supers. A fresh water source is required to minimize bees going to neighbouring properties. This is really great to see – the guidelines are reasonable and approachable, the proposed process allows the City to take action when necessary, and the City is encouraging education and community around beekeeping. I’m excited to see urban beekeeping moving ahead in Edmonton! There are no specific restrictions on the sale of e-cigarettes. Because they are relatively new, Health Canada has not fully evaluated them and generally advises Canadians against purchasing or using them. Because of that, e-cigarettes cannot be used in AHS facilities nor inside City facilities. Existing Mechanisms – Rather than issue a $250 fine, officers could require a mandatory court appearance. Enhanced Responsive Services – This would require additional staff, and therefore, budget. The first two would have no cost implications. One report deals with the terms of reference for the new Gender Based Violence and Sexual Exploitation Prevention Council Initiative, which will be led by Councillors Esslinger and Sohi. Another report recommends that Council grant $100,000 from its 2015 Contingency fund to support the Aboriginal Day Live! Concert and Celebration event. There’s a recommendation at the City enter into annual sponsorship agreements with the World Triathlon Series Edmonton, to fund the even in Edmonton between 2015 and 2019 to the tune of $1.2 million a year. One report provides an update on enforcement of an amendment to the Animal Licensing & Control Bylaw that was made a year ago to deal with Nuisance Dogs. After the first year of operation, there are 67 licensed Nuisance Dogs, and of the 3600 total dog at large complaints the City received, 9 were for Nuisance Dogs. The Edmonton Historical Board and Edmonton’s Historian Laureate will present their 2014 Annual Report. There’s one private report on the agenda and it deals with information and analysis related to the Police Helicopter. It is the third time-specific item at 1:30pm and Council approval is required. A different report says that in 2014, 20% of the interactions EPS had were with non-residents. I can’t say that I’m thrilled with the second point (I’d rather see a separate point on privacy and not diminish the “open by default” commitment), but overall, I think this is a big step in the right direction. I expect Council will be happy with it too. Three of the five communications actions have been completed, including work on the website and the development of the Good Neighbour Construction Guide. Three of the five collaboration actions have also been completed, including the Infill Tour and the Infill Planning Academy Course. One of the three knowledge actions has been completed – the creation of a document that provides a basic understanding of drainage services in Edmonton. Twp of the five rules actions have been completed (these deal with zoning changes). Two of the five process actions have been completed. Council is considering the formation of a Northern/Circumpolar Initiatives Secretariat that could help Edmonton “achieve significant progress in the Northern/Circumpolar region through supporting and building partnerships with northern communities.” EEDC was directed to develop a business plan for the initiative, which this report includes and summarizes. The area of influence would be the Edmonton region, but also Whitehorse and Yellowknife. The hope is that Edmonton can form partnerships with northern communities around issues like health care, education, commerce, innovation, and community development. The idea would be to formally create the Secretariat by the end of Q2 2015. The City, EEDC, the Edmonton Chamber of Commerce, and the University of Alberta would provide funding and in-kind resources as partners in the initiative. Council has already approved a one-time package of $90,000 for 2015. The Canada Packers Smoke Stack located at 12403 Mount Lawn Road NW will likely be designated a Municipal Historic Resource with $265,000 in funding for rehabilitation. A report on addressing barriers to multi-unit family oriented development identified three regulatory barriers and says they are being examined as part of existing projects. Incredibly, a survey found that “there is a perception that the city prohibits provision of parking.” I wish! There’s a progress report on Building Permit and Inspection Services which notes the backlog of open permit files was 13,181 at the end of 2014, which is down 66% from the end of 2013. The audit recommends that the City “optimize the use of existing technology” and the report notes that some changes have been made already, such as automated email notifications and the use of GPS tracking for inspections. The next Transportation Committee meeting takes place on Wednesday from 9:30am until 5:30pm. 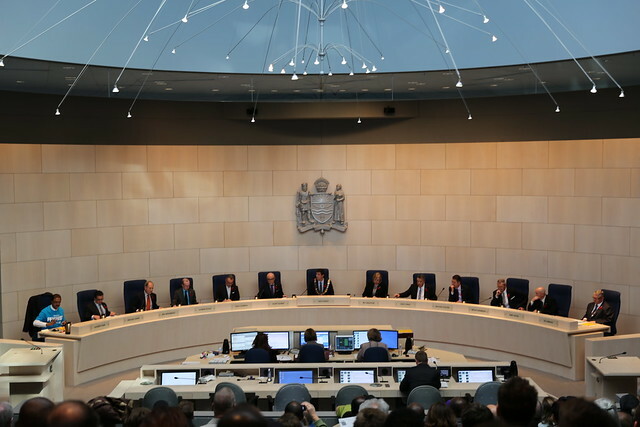 There are five reports on the agenda, as well as one response to an inquiry made by Mayor Iveson. I don’t think there’s much new here, but the report provides an update on the inquiry that Mayor Iveson made about getting connected when you ride the LRT. The City is targeting Q4 2015 for service in the tunnels. They are currently discussing the implementation of “a single co-location solution” that would allow any service provider to “connect to a common carrier supported infrastructure”. So instead of every company installing hardware, one set of gear will be installed that all will share. Can’t wait to see this roll out! This is a pretty big report with four attachments. The recommendation to Council is to approve the Environmental Impact Screening Assessment, to approve the list and locations of Major Facilities, and to approve the upgrades for the construction access route through the west side of Louise McKinney Park. This report summarizes the process for managing 311 calls received for snow and ice control operations. Improvements for managing these calls have been made and more are planned. For instance, revised scripts reduced the ratio of calls being referred to Roadway Maintenance from 63% to 49%. For the 2013-2014 season there was a total of 47,779 calls, and that decreased to just 22,186 in the 2014-2015 season. The report says that 82.7% of notifications are closed within 5 business days, which is an improvement from 53.8% last time. You can see snow & ice maintenance calls into 311 using the 311 Data Explorer. Since 2011, ETS says it has seen a 17% increase in security-related files due to rapid ridership growth “without a proportionate increase in Transit Peace Officer staffing levels.” In order to “maintain the reputation of Edmonton Transit as a safe, secure and welcoming system” with the activation of the Metro Line to NAIT another six Transit Peace Officers will be required. The report also notes than the Metro Line presents “unique security challenges” due to its proximity to the downtown arena and entertainment district. And though the Transit and Police Partnership Team pilot project has been positive, it also demonstrated the need for more security as a total of 140 arrests, 450 warrant executions, and 329 ticket violations were generated in a five month period. Alternatives to adding new Transit Peace Officers include sticking with the status quo, engaging police, or hiring private security. The cost for wages, benefits, equipment, and training for six Transit Peace Officers from June to December 2015 is $354,000 and $607,000 for 2016. An update on an open tender for the project to widen Whitemud Drive from 75 Street east to the TUC. Options for parking in the area of 66 Avenue and 88 Street, based on discussions with the Edmonton Christian Community Church and the Argyll Community League. Executive Committee is meeting again on Thursday afternoon. There’s just one item on the agenda, and it’s a private, verbal report: Civic Agencies Recruitment – Applicant Interviews. This is a continuation of an ongoing item.